The Rifter 64 is our annual horror issue. This one presents chills and monsters for Beyond the Supernatural, Dead Reign, Nightbane and even for the Palladium Fantasy RPG. There is a 'Giant' adventure (as in an adventure about Giants) for Palladium Fantasy and Black-Malice Legacy Part Two with more details about the Coalition States' Psi-Division. Plus stories, news, coming attractions, and more. 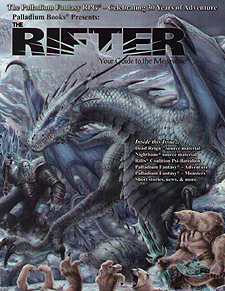 Every issue of The Rifter is an idea factory that helps players and Game Masters to generate new ideas and keep their games fresh. It provides useful, ready to go, source material gamers can just drop into their ongoing games. A doorway to new possibilities and numerous Palladium role-playing worlds. It offers new characters, OCCs, powers, magic weapons, adventure and ideas for your games. It presents new villains monsters and dangers to battle, and new ideas to consider. Every issue has material for Rifts and at least two or three other Palladium game lines. Palladium Fantasy RPG - New creatures: Ice Bearmen and the Winterserpent by Matthew Clements, Chuck Walton and Kevin Siembieda. "Official" Fantasy source material. Palladium Fantasy RPG Adventure by Michael Osborne. An adventure about undead Giants, dark magic and adventure. Can be played with Giant characters. Rifts - The Black-Malice Legacy, Part II - by Matt Olfson and Will Hunter. Source material about the Coalition States' psionic operatives and technology, including squad formation and new psychic martial art training for special operatives in CS Psi-Battalion. Rifts Short Story - A Cold Night, Dead Past by Brett Caron. Dead Reign source material by Jeff Duncan. New Survivor Occupations and related skills set in the Zombie Apocalypse. Nightbane source material by Bryant Telfer. A new class of mystical wanderer and Nightbane. Rifts NG/Minion War story (and hint of things to come) by Matthew Clements. Heroes Unlimited Short Story by Glen Evans. 96 pages of fun and adventure in the Palladium Megaverse.